The Progressive Gazette: Memo to Obama: This Was Their Red Line! Memo to Obama: This Was Their Red Line! 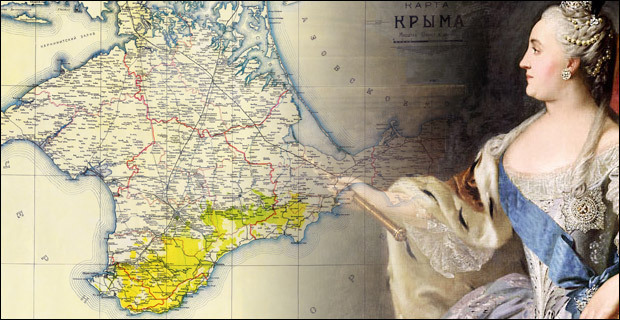 In 1783 the Crimea was annexed by Catherine the Great, thereby satisfying the longstanding quest of the Russian Czars. And the portrait of the Russian ”hero” hanging in Putin’s office is that of Czar Nicholas I—who’s brutal 30-year reign brought the Russian Empire to its historical zenith, and who was revered in Russian hagiography as the defender of Crimea, even as he lost the 1850s war to the Ottomans and Europeans. Besides that, there is no evidence that Putin does historical apologies, anyway.